Former world time trial champion Michael Rogers has joined Britain's Team Sky for the next two seasons. The Australian, 30, said: "I like the direction and general outlook of the team and am delighted to be here." Rogers, who was formerly a team-mate of Mark Cavendish at HTC-Columbia, won three consecutive world time trial titles from 2003-05. "He is a consummate professional and great addition to the team," said Team Sky's sports director Sean Yates. "Michael has proven himself in big races right throughout his career, and that experience will be an invaluable asset to us." Rogers is likely to spearhead Sky's Tour de France challenge with Norway's Edvald Boasson Hagen and Briton Bradley Wiggins. Yates added: "He still has a lot of racing in him and is ambitious about what the future holds. Will Rogers help Team Sky challenge for top honours? "I'm expecting him to spearhead a lot of our attacks and am sure he can help us gain some great results." Rogers turned professional with Mapei in 2000 and had his first major success on home soil at the 2002 Tour Down Under. Among his many honours are wins in the Tours of Germany, Belgium, Andalucia and California. 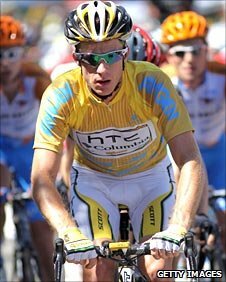 He achieved a top-10 finish in the 2006 Tour de France, and was in contention the following year before breaking his collarbone. Rogers told Team Sky's website: "I already know a lot of guys in the squad so I'm expecting to settle in pretty quickly and am really looking forward to it. "In terms of racing, week-long stage races are going to be my main priority at the start of the year but that's not to say I won't be riding Grand Tours anymore. "I'm in the peak years of my career and I'd like to think if things go well I could still have something to offer in those races as well. We'll just have to see."